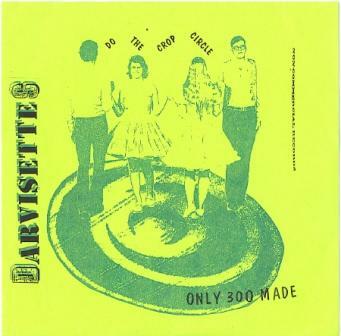 Another big want that I'm finally able to knock off from my want list: the uber rare Darvocets "do the crop circle" 7" released exacly 20 years ago by Non Commercial Records in the mere quantity of 300 copies only. I've been worshipping these guys for such a long time that is still hard to believe that I finally own a copy of their debut release. A mate from downunder unloaded to the masses his collection recently. I've asked him to sell me his copy so many times that I kinda feel like this copy had to be mine. The deal went super smooth (he even thrown in a great extra ep for free!) and a couple of weeks later this ep's journey from the other side of the globe ended safely in my mailbox. Darvocets were the weird band from the clevo scene. While all the clevo bands have that distinctive sound that make them unique and easily recognizable, this stuff would indeed fit better in a Killed By Death compilation. Both musically & lyrically, D. sounds like that dumb retarded kid who did way too much psychedelic drugs and had a morbose obsession for ufos, aliens & sci-fi horror movies. All of course done with a good dose of tasteless humour that makes me appreciate these guys even more! Not only this record is quite hard to find, but there are several cover version. Regular one with coloured back cover, super limited "Darvisettes" version and photocopied sleeve (this one, unsold stock copies that the band sold around 2005-06). Good luck scoring one!